On the 18th of November, The Pensions Archive Trust (PAT) was delighted to hold a reception to welcome Kelly Twiddy and Matthew Stemp of UBS Global Asset Management to London Metropolitan Archives to thank them for their donation to the Pension Archive collections of copies of the organisation's Pension Fund Indicators dating from 1973 to 2008, and Annual Surveys from 1993 to 2000. 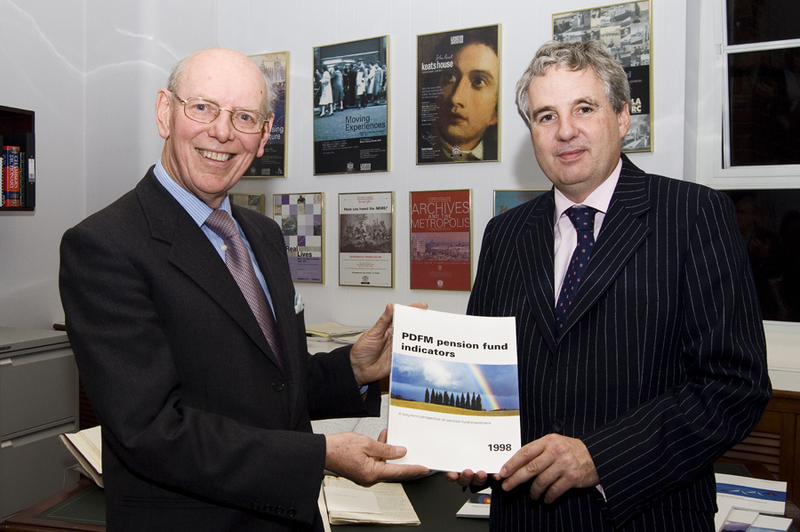 Alan Herbert, Chairman of PAT, spoke of the reports' importance to the archive collections, "They are a welcome addition to the archive and will considerably assist it in recording the history and development of occupational pensions provision in the UK." As well as hard copies, electronic copies in PDF format of all of the PFIs and Annual Reports were also donated, which will enable increased user access from PCs at LMA and allow for copies to be produced at a faster rate for users who request them. For all collection enquiries, please contact the PAT archivist or Enquiries Team at LMA.